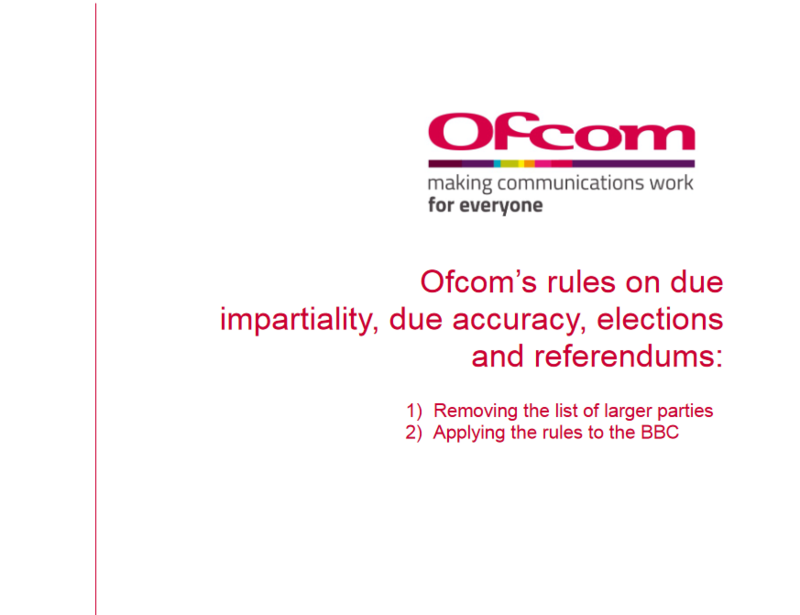 On 9 March 2017, further to its consultation published on 10 November 2016, Ofcom has published its revised rules on election coverage on TV and radio and due impartiality. The document sets out Ofcom’s decision to amend Section Six on elections and referendums of its Broadcasting Code and its rules on party political and referendum broadcasts (“PPRB Rules”) in order to remove the concept of “list of larger parties”. Broadcasters will have greater editorial freedom to take decisions in the area of elections by reference to evidence of past electoral support and/or current support, whilst candidates and parties will retain the ability to appeal to Ofcom about broadcasters’ decisions. In order to help broadcasters to take editorial decisions during election campaigns, Ofcom will publish an annual digest of past electoral and current support in the lead up to each set of May elections. The document also sets out factors Ofcom takes into account when making decisions in the area of elections, including that it considers more important evidence of past electoral support than evidence of current support (e.g. opinion polls). In this document Ofcom also confirmed its proposed approach for regulating BBC editorial content in the areas of due impartiality, due accuracy, elections and referendums (Sections Five and Six of the Code, and Ofcom’s PPRB Rules) which will only be applicable for the period from 22 March 2017. On 3 April 2017, the new Royal Charter and Framework Agreement for the BBC published by the Government on 15 December 2016 will come into effect. The aforementioned revised rules will come into effect on 22 March 2017, when the first election period for the May 2017 local elections commences. Ofcom will issue them on the same date and will also publish its updated Guidance to Sections Five and Six of the Code.